Padial. Socorro Rojo de España, Comisión de Propaganda. Misery, destruction, persecution and death. David Duke. Foiled by the Redskins. And friends. David Duke,* white-supremacist, racist, anti-semite, holocaust denier, nazi sympathiser, homophobe (the list is rather long), former Grand Wizard (oh, please, how old are these people?) of the Ku Klux Klan, and former jailbird was in Barcelona on Saturday evening to spread the word. David (a rather unfortunate name for an anti-semite) believes North America belongs to North Americans. Preferably the blonde, blue-eyed sort. He seems to be forgetting something. David was born in Oklahoma. Land of the Cheyenne, the Comanche, the Black Pawnee. Amongst others. So it seems fitting that his talk at a neo-Nazi bookshop in Barcelona was cancelled, in part, because of the protest organized by young anti-fascist groups, including skinheads who call themselves "Redskins." Of course he also believes Europe belongs to Europeans. He had come to Spain, allegedly to promote some anti-semite book he´s written, but more likely to spread his racist venom on the dangers of immigration. Early in the afternoon all streets leading to the bookshop were blocked by rows of riot police. Few, apart from the press, were allowed access and those who were were searched and asked for identification. act at the first signs of hate-mongering. This would probably have left him with very little to say. In a subsequent declaration to the press Duke "lamented that Barcelona was the only city in Spain where he had been unable to present his book." I have great taste in cities. Duke. But perhaps they should themselves reflect on the dangers of racial hatred. the riot squad were out in force. But this time, I'm pleased to say, there was minimal gratuitous violence. 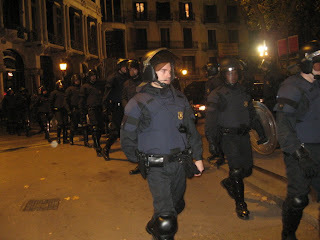 The squad looked a little bored, the batons, shields and rubber bullets superfluous. Contingents occasionally skipped off, one behind the other, in their manly boots to look for the main body of demonstrators who had disappeared somewhere into the night after burning a white-robed effigy of Duke from a lamp post. Finding all approaches to the bookshop blocked they soon marched back but stood around in peaceful protest till the news came that the conference had been cancelled. Standing around in the cold I was reminded of the photos I had seen of a very different farewell. On October 28th 1938 Barcelona paid homage to the International Brigades, men and women who came from all over the world to fight for the Republic. They were finally forced to leave to comply with the terms of the Non Intervention Agreement. Thousands of people lined the streets as they marched by during the farewell ceremony, by coincidence just a few hundred yards away from where Duke was planning to speak. But the message then was a little different. You will not be forgotten.... Come Back. By one of those strange coincidences the 20th November is also the anniversary of the death of General Francisco Franco. Almost forty years after his bloody military coup he died in his bed. 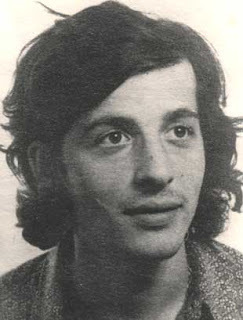 I prefer to commemorate the death of the Catalan anarchist Salvador Puig Antich, the last person to be executed by garrotte vil on Franco's orders on the 2nd March 1974. A recent film, "Salvador", relates a romanticized, falsified version of his life and execution. I prefer to recommend the film "El Verdugo" (The Executioner, Luis Garcia Berlanga. 1963), a black comedy about capital punishment and one of the best Spanish films I´ve ever seen. 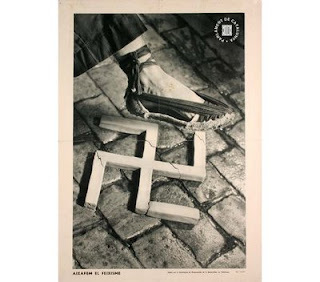 The 20th November is also the anniversary of the execution by the Republicans in 1936, of the founder of the Falange, José Antonio Primo de Rivera. It is not a coincidence that last week, with a variety of commemorative acts and demonstrations organized by right-wing, neo-Nazi groups and others who mourn the passing of the dictatorship, the American white-supremacist and former leader of the Ku Klux Klan, David Duke, was invited to speak in several Spanish cities. Graffiti. Legal, but still graffiti. 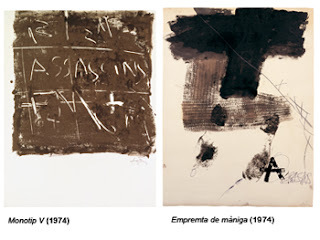 In 1974, the year of Puig Antich´s execution, the Catalan artist Antoni Tapiès had an exhibition in the Maeght Gallery in Paris. The painting on the left, "Assassins", was used for the poster advertising the exhibition. It was posted all over the streets of Paris. 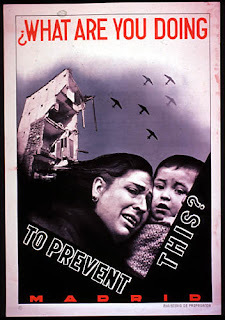 When the air raids began on Madrid and civilians, including children, died the Republican Government published this poster. Perhaps they thought France and England would change their minds? Both had rushed to sign the Non-Intervention Agreement in August 1936 which was then ratified by twenty-seven other countries. Basically this meant the much-needed supply of arms to the democratically elected, legitimate Republican Government was prohibited. The fascist rebels, of course, had no problem flouting the ban with troops, planes and war material from Italy and Nazi Germany. The poster probably did affect international public opinion, there is nothing like a woman crying with a child in her arms to move people. But she wasn´t crying in fear of the bombs. 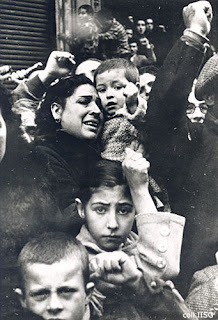 She was crying for Buenaventura Durruti. 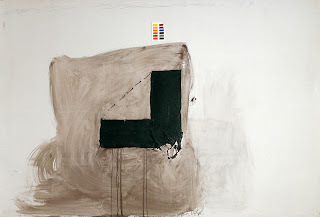 "The bourgeosie may blast and ruin its own world before it leaves the stage of history. We carry a new world here in our hearts." The anarchist leader Buenaventura Durruti died in Madrid on the 20th November 1936. He had been shot the previous day in circumstances which have never been fully explained. His body was taken to Barcelona where his funeral was attended by a quarter of a million people. 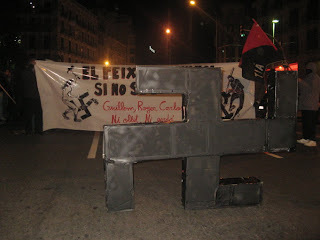 The photo above was taken as the cortège passed on its way to Montjuïc cemetery. who gave their lives, who were persecuted, imprisoned, tortured and shot or forced into exile in defence of anarchist ideas and the CNT. In 1936 Joaquina Dorada was a member of the Iberian Federation of Young Libertarians of Poble sec. An active participant in collectivizations she became Secretary of the woodworkers' union. 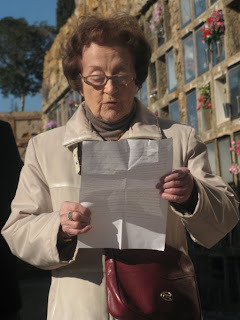 Imprisoned several times after the war for clandestine anti-Franco activities, when sentenced to 15 years in 1952 for "aiding the rebellion" of 1936 she replied: "What rebellion? The rebels were the fascists." She escaped to France in 1957. 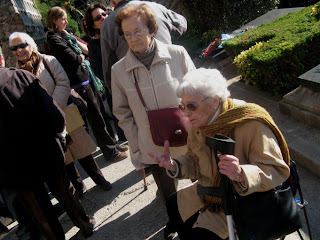 Anarchist member of Les Dones del 36 (The Women of 36) an association formed in 1997 to explain the experiences of Republican women during the Spanish Civil War, Concha fought with the CNT at the Aragon front until the women were ordered back to the rearguard where she spent the rest of the war as an active member and worker in a collectivized factory. She was an adviser to Ken Loach for his film "Land and Freedom." Standing on the far left is Durruti´s daughter Collette. Noone seems to be very sure exactly how many people died in the Second World War. Fifty million ? Sixty million? 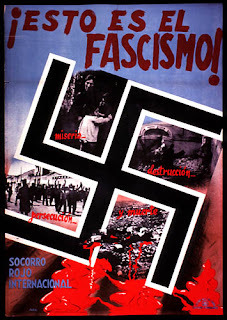 "You don´t argue with fascism, you destroy it." 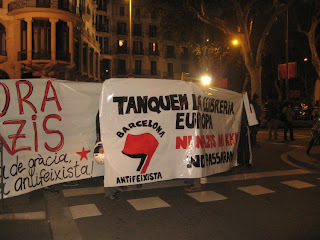 On the 11th of November Carlos Javier Palomino was on his way to protest about an anti-immigration demonstration in Madrid which had been organized by the neo-Nazi group Democracia Nacional (National Democracy). He was stabbed to death on the underground, apparently by a professional soldier in favour of, and probably on his way to, the demonstration. Carlos was 16 years old. Yesterday in Barcelona, as in other Spanish cities, a protest was called. They came in hundreds, dressed like punks and skins. It ended in a street battle with the police.